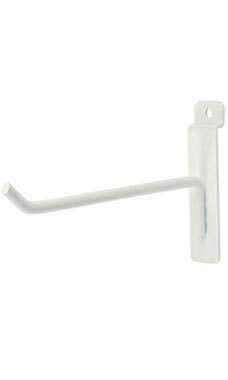 Truly maximize your Slatwall display's potential by purchasing this White 8" Slatwall Hook. Measuring 8 inches in reach, this hook is perfect for any size item and can support a large quantity of items. The white finish will fit well in any setting you put it in, as it does not distract customers from the items on display. This Slatwall peg is easy to assemble by simply sliding it into any section of Slatwall, arranging the display to your liking. Perfect for any retailer! In stock and available for immediate shipment. Best hooks and amazing price. We save a lot of space with them. Wish I had gotten them a long time ago. Look and work great! This was my first purchase with Suppystore. After placing the order one day I called to change the color the next. Their staff was very curtious and willing to help me correct my order. It shipped the same day I placed the correction. The products I purchased where the lowest price I was able to find anywhere. The quality is very good with a high polish on all the hangers. I will purchase from your store again , thank you.